We hadn’t even known about the treehouse on Umlani’s grounds, much less planned ahead and booked a night there, before we checked in. In the spirit of the safari adventure, though, when we were told it would only be available our first night, we jumped at the chance to spend a night under the African stars. Neither of us could begin to imagine what was in store. 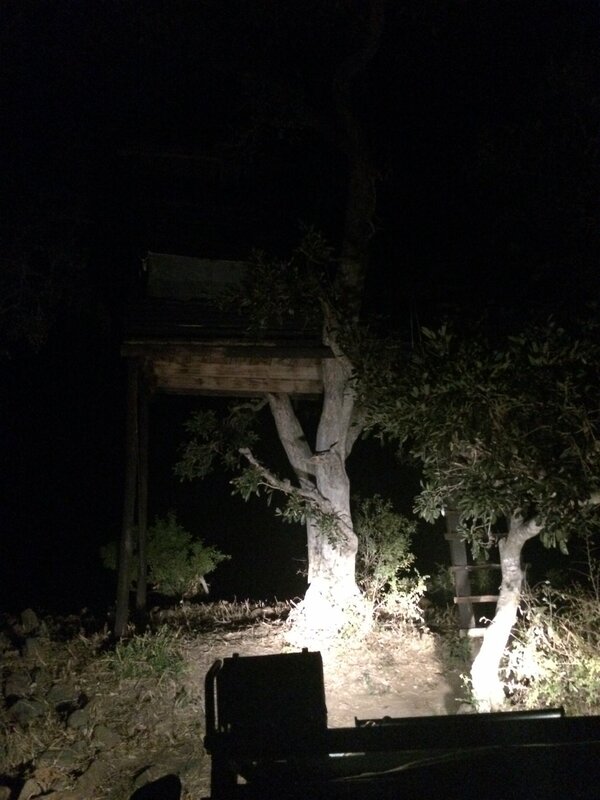 We arrived at the treehouse after dinner, around nine, and it appeared every inch the perfect setting for a rustic adventure, without civilization in sight. After a few hours spent intermittently talking and shushing each other to better hear the bush sounds punctuating the boundless darkness stretching in every direction, we both dozed. While we didn’t see any animals during those first few hours before sleep, despite our constant scanning of the horizon with our torch, faces pressed to the mosquito net, what we heard told us we weren’t alone. At one point, I replied ‘bless you’ to a sneeze I assumed came from Cynthia, who responded that it hadn’t come from her. Only much later did we both realize that the sneeze I had so reflexively answered had come from a lion, only meters away. After sleeping for a few hours, we awoke in perfectly synchronized alertness – there was loud splashing coming from the nearby watering hole. Both completely, immediately awake, we groped for camera and torch. After shedding some light on the matter, what we saw was the beginning scenes of an epic next few hours: a lone, enormous kudu buck, in a stand-off with a single hyena, directly below our home for the night. We were already watching the animals in slack-jawed disbelief at our luck, when the hyena disappeared, and was replaced by a female lion, who came bounding out from under the tree in which we were perched. In what seemed a single, unbelievably graceful motion, the lioness pounced on the kudu, grabbed it by the neck, and dragged it to the watering hole. There, it lay in the shallow water, maintaining its tight, toothy grip, until the life left its prey. We were so close to this that we heard every desperate noise along the way – the thrashing of the kudu’s legs, the water bubbles rising to the surface, marking the animal’s last breath. Soon after the kill, another female lion arrived on the scene, joining its compatriot at the water’s edge to begin feasting. 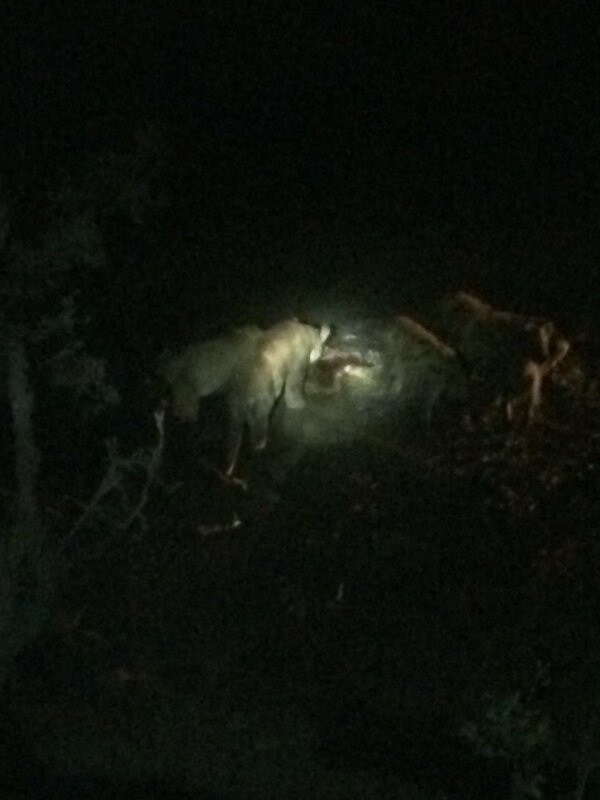 However, they weren’t left alone for long – one hyena after another began crawling out of the darkness’ edge. Soon, the smell of hyenas filled the air, intermingling with the already pungent scent of the dead kudu. 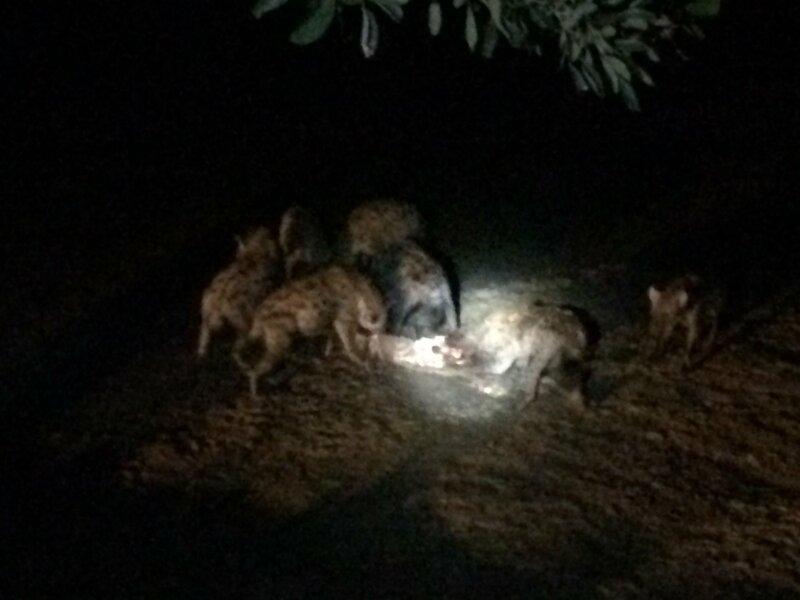 As the hyenas streamed in, our excitement and disbelief gave way to primal fear – with their calls and cackles, running footsteps, and crunching of the kudu’s bones echoing around us until it sounded like they were right next to us in the treehouse. The noises gave new meaning to the term ‘surround sound’, and at this point, we felt like they were coming for us, too. We counted two lions and four or five hyenas, then shut off the torch, radioed the camp, and sat in silence, barely trusting our breathing not to betray our presence. (Would or could the lions and hyenas climb up? Somehow catapult themselves? Work together to cut down the tree? In our state of panic, we didn’t know, and didn’t want to find out). 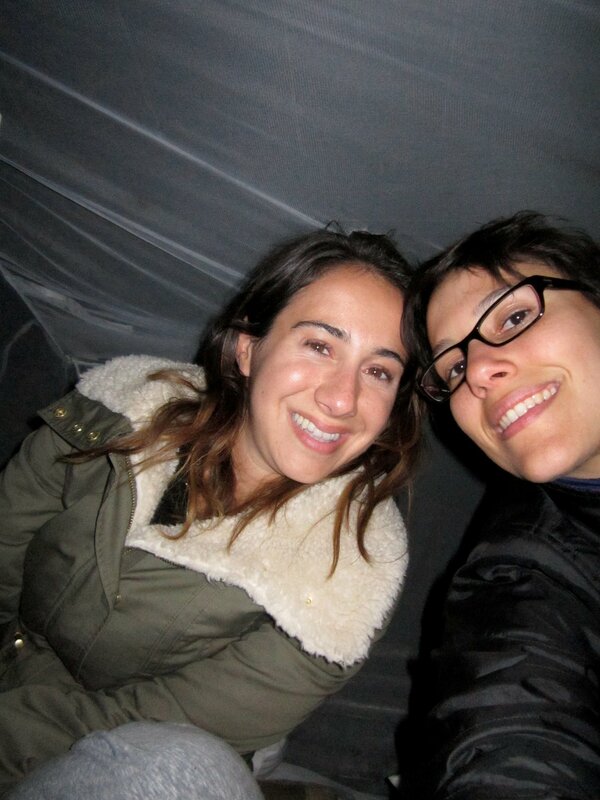 The next mammals to join us were, thankfully, camp staff and rangers. As soon as we saw their headlights in the distance, we turned the torch back on, both because we automatically felt safe again, and to show them where the action was so they could keep their distance. In the bravest feat either of us had ever seen, one of the rangers, Herbert, somehow managed to exit his vehicle, walk among the lions and hyenas, and climb up to us. (We later learned that this was even braver than we had thought: Herbert had wanted to drive over in a closed vehicle, unsure he could even reach us in the state of things. Instead, wanting to get to us as quickly as possible, he drove over in one of the open trucks, parking meters away from the gathering predators). 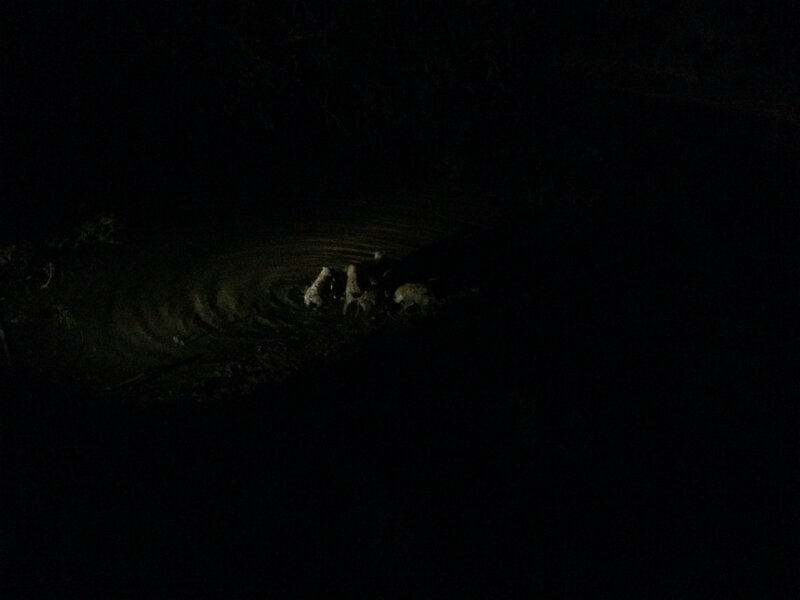 With the watering hole now illuminated by car lights and torch, we now saw that the lionesses and hyenas were engaged in a bitter brawl. The lions snarled at the hyenas, before realizing the futility of the situation and abandoning their kill. The hyenas had won, and they wasted no time in sending out the signal to clans near and far. In what seemed like no time at all, dozens of hyenas arrived at the watering hole, laughing, growling, bickering, and most of all, eating. Herbert counted 25 at one point. They devoured the kudu, grabbing any bones, organs or skin they could. One, injured from the battle with the lion, lay at the outskirts of the melee, tending to its wound. Juveniles also hung at the edges, hoping for a piece of the action but mindful of their place in the hierarchy, often resorting to fishing for floating bits of meat and innards in the watering hole. Glowing blue eyes surrounded us as far as one could see. Throughout the feeding frenzy, which lasted at least two more hours, Herbert told us all about the animals, from explaining general information about their habits to identifying each specific call being made. Between this wealth of new knowledge, our witnessing of the entire, incredible occurrence, from trapped kudu to powerful lionesses to triumphant, multiplying hyenas, and our amazing vantage point, we have never felt like such a part of nature. This feeling only intensified when we eventually left the treehouse and walked among the hyenas to reach the truck in the still-dark night, trusting Herbert’s repeated assurances we were safe. To say our experience at Umlani exceeded our wildest (pun intended) expectations, and then some, would be the understatement of the century.